Archaeologists have found that a 20-foot high mound in Slough, thought to be a Norman castle motte and for centuries the centrepiece of a bizarre Eton College ceremony, is actually a rare Saxon monument, built 1,500 years ago. University of Reading archaeologists say that Montem Mound in the Berkshire town, now surrounded by Municipal buildings and car parks, dates roughly to the same time as the famous burial mounds of Sutton Hoo in Suffolk, and the nearby burial mound at Taplow. It is likely to mark the resting place of someone of high status and could contain artefacts. The discovery of the ‘Sutton Hoo of Slough’ is a remarkable finding as only a handful of mounds from this period are known about. The findings go against the previous assumption that it was a Norman Conquest-era ‘motte and bailey’ castle. Dr Jim Leary, the University of Reading archaeologist who led the investigation in December 2016, said: “Conventional wisdom placed the Montem Mound 500 years later, in the Norman period. But we have shown that it dates to between the 5th and 7th centuries, not long after the collapse of Roman Empire. The mound is already a statutory Scheduled Ancient Monument which protects it from development. The archaeological investigations at the site were agreed with Historic England, and consent was granted by the Secretary of State. It is managed as a historical feature as part of Slough Borough Council’s parks and open spaces services. The Council is already preparing an enhancement scheme with an interpretation board so that everyone can understand the importance and history of this special green mound. The discovery was made during a Leverhulme Trust-funded project called the Round Mounds project. It is using a novel technique to drill into and date mottes in England for the first time, to learn more about when they were built. This technique enables vital information to be gathered whilse causing minimal harm to these precious archaeological sites. Working alongside colleagues at the Scottish Universities Environmental Research Centre at East Kilbride, the team from Reading has shown that, although the majority of the mounds investigated so far were built in the period immediately after the Norman Conquest in 1066, there are some remarkable exceptions. Last year, the team found that a motte in Skipsea, East Yorkshire, originated in the Iron Age. The new results show that Montem Mound – which is roughly circular, 34m in diameter and up to 6m high – dates to the early Saxon period and therefore joins a highly select group of monuments. This area was conquered by Mercia in the early 7th century and probably under the dominion of a Kentish sub-King. In recent centuries, the mound was used for Eton College’s ‘Montem’ ceremony. The ceremony was held annually from the founding of Eton College in the 16th century until the late 18th century, after which time the event was held triennially until it was abolished in 1847. The Montem festivities took various forms over the centuries, always involving a procession to the mound of school boys in fancy or military dress, and the collection and giving of ‘salt’ and money from visitors and passers-by. 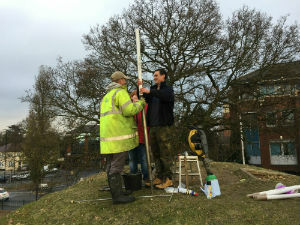 The University of Reading archaeologists will next be drilling Forbury Hill, in Forbury Gardens near Reading Abbey, in order to carry out the same radiocarbon analysis to date it. On 8 June, the team will drill a borehole from the top of the mound down to the base in order to gather evidence from the material, such as charred seeds or pollen, to give them clues as to when it was built and what the environment was like. It has been previously speculated that the hill was built to fortify the Abbey in the 12th century, however the work of the Reading team will help uncover the true reason it was built.